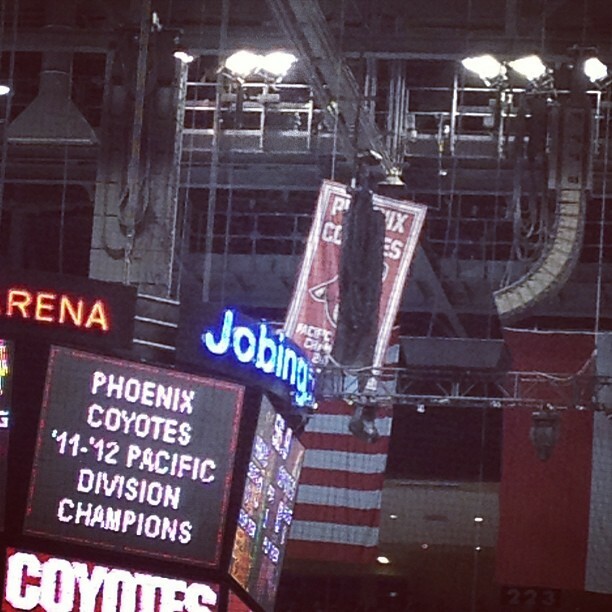 First of all - and with no disrespect toward the Coyotes Organization or Jobing.com Arena staff - that Pacific Division Championship Banner "unveiling" was just... pathetic. And it was cooked. Our own players were laughing when it was "unveiled"... come on! But the take home replicas they gave us were fantastic. That aside - the most important thing is: hockey is back!!!! And last - but the farthest thing on EARTH from least - I'd like to introduce you to the newest member of our Hockey Family - Izzy - who made an appearance at her first tailgate yesterday. 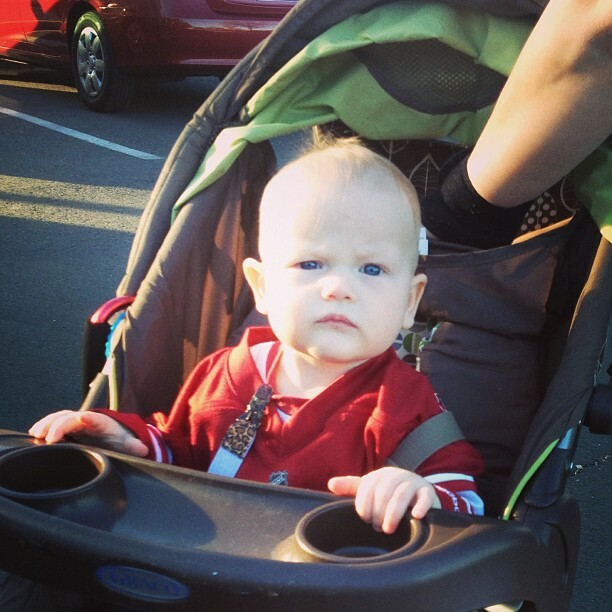 She's practicing her intimidation techniques - we think she might have some enforcer in her. I think Ray Whitney probably put it best - what you witnessed this season was the definition of the word "team". All the way up to when they cleaned out their lockers at Jobing.com Arena this week. 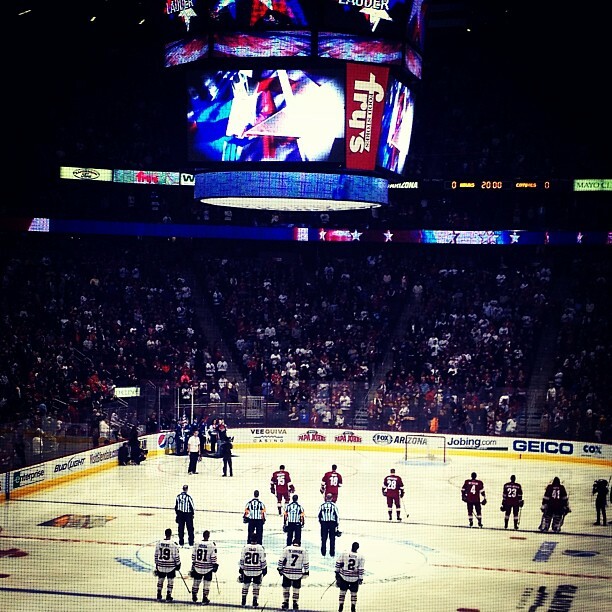 Hockey came alive in the desert this summer. 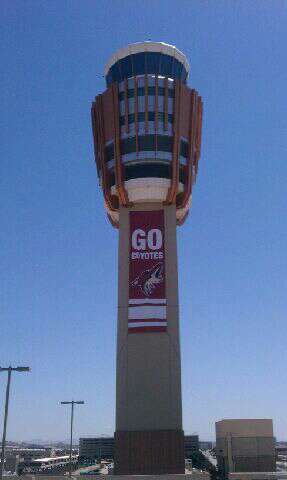 Airport Tower at Sky Harbor Airport, image via.. There proved to be some hockey fans here after all. And they're going to get it. 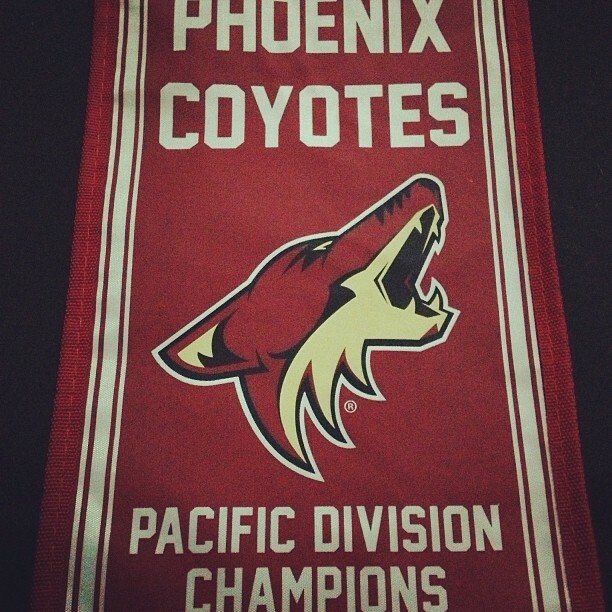 Thank you, our Phoenix Coyotes for an amazing season and one helluva Cup run. I remember sitting in a mostly empty Jobing.com arena my first Coyotes game several years ago and thinking to myself... "I can't believe no one is here... Why is no one here? This is AWESOME!!! I better go get season tickets now. Pretty soon they will be hard to come by!" That was the innocent, uninformed rookie Heather. The Heather that had no idea what was coming a few years down the road. 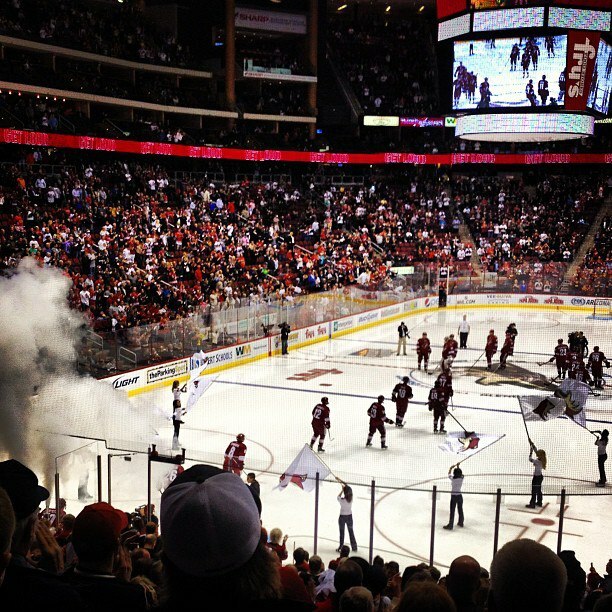 The Heather that was shocked when people laughed and looked at me crazy when I said I was a Phoenix Coyotes fan. Those next few years brought many wonderful people into my life. The people I now refer to as my Hockey Family. You'll see some of them in the first video. 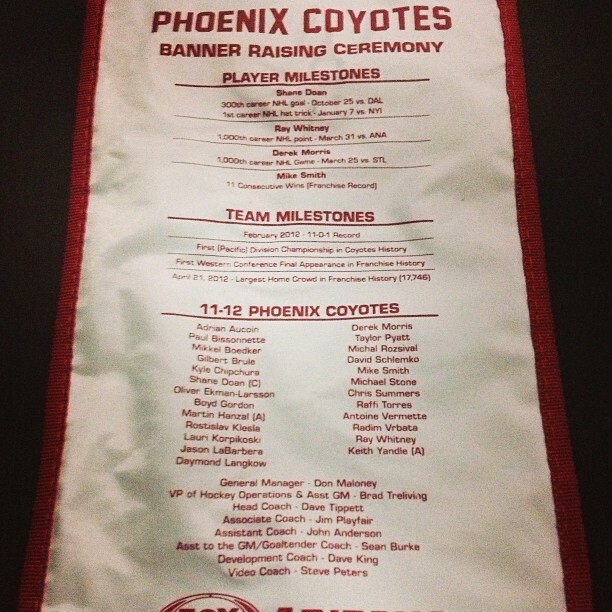 Those were also the people I sat surrounded by as my team made history and advanced to the Western Conference Finals for the first time in franchise history last night. They were the people I cried with as the final buzzer sounded. We'd cried together before - but not for happy reasons. Please excuse the shakiness you see when that final buzzer went off. It's hard to scream, clap, cry, high 5 and cheer all while attempting to capture the moment on video. Now the below song may seem strange - but it's an accurate representation and proper salute to those Coyotes fans who have stuck through it with this franchise through the good times we're now having - and the mostly bad times the team went through since they moved here. To Monique & Heather S. who never made me sit in the back of bankruptcy court alone - you'll get why I chose this song. 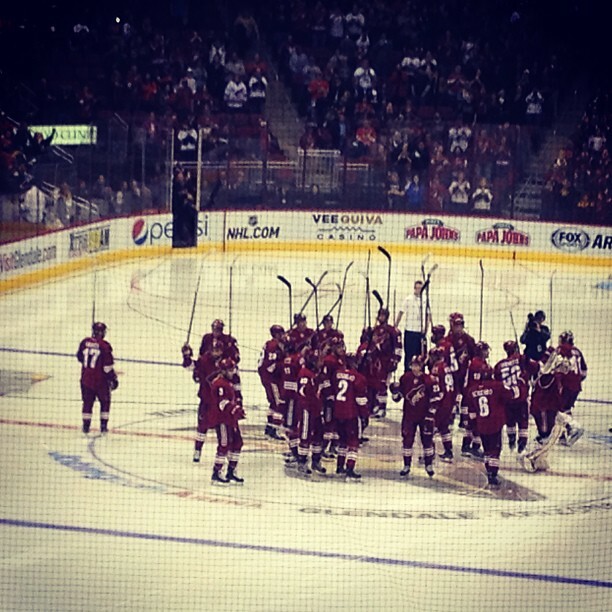 We sat there huddled together all alone sometimes - the only Coyotes fans there - as the talking heads ripped our team apart. It wasn't fun. It wasn't easy. It wasn't convenient. But we were there. To those of you who follow my twitter feed and offered me support and convinced me not to throw a shoe at Jim Balsillie and his lawyers... You'll get why I chose this song. To my hockey family, who sat with me year after year as we watched our seasons end long before the Stanley Cup was awarded. You'll get why I chose this song. Because we didn't give up - even when the skies got rough. We gave 'em all we had - because we knew they were worth it. And they are... they always have been. If this is as good as it gets this season - I'm ok with that. 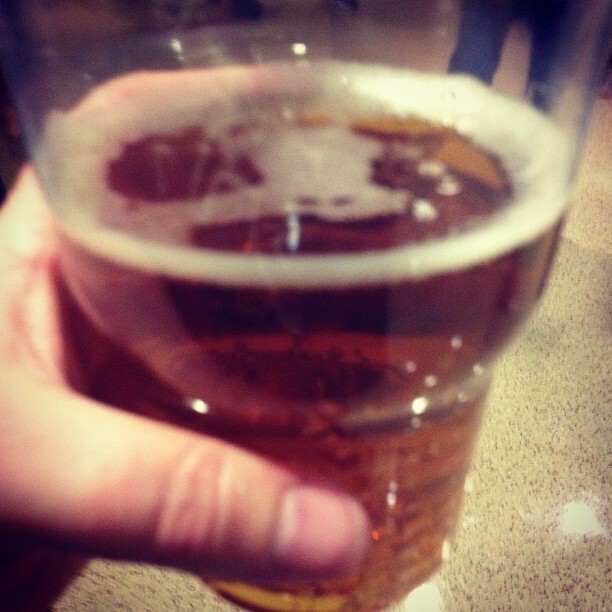 We're going to the Western Conference Finals! I just wanted to share this with ya'll - Howler spent the day Tuesday doing pep rallies at the local schools in Glendale. 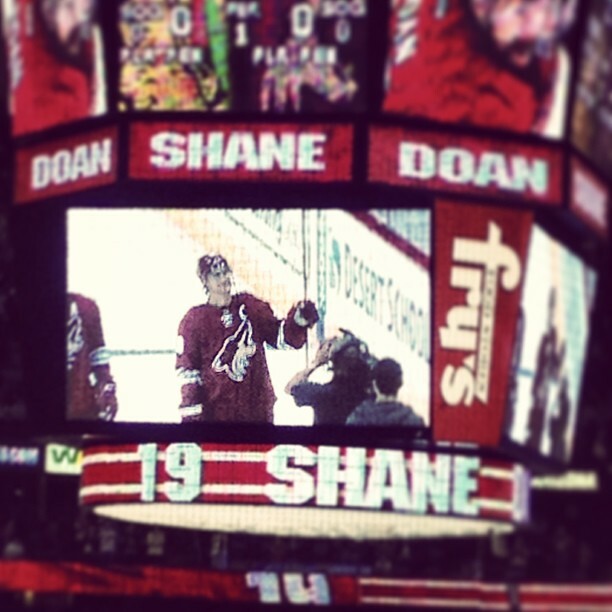 I'm happy to see Fox Phoenix going out and helping to grow the excitement of the Phoenix Coyotes playoff run. This is where we start folks - get the kids hooked on hockey first! It'll get ya every time! Am I supposed to be somewhere on Wednesday? SportsMemorabilia.com - a one-stop shop for sports memorabilia fans!